Verdi’s Best “Opera” His Requiem? Verdi’s “Manzoni” Requiem (written in honor of Alessandro Manzoni, the composer’s friend and colleague), often called Verdi’s “best opera,” is this week’s featured, sole work on the BSO subscription series. 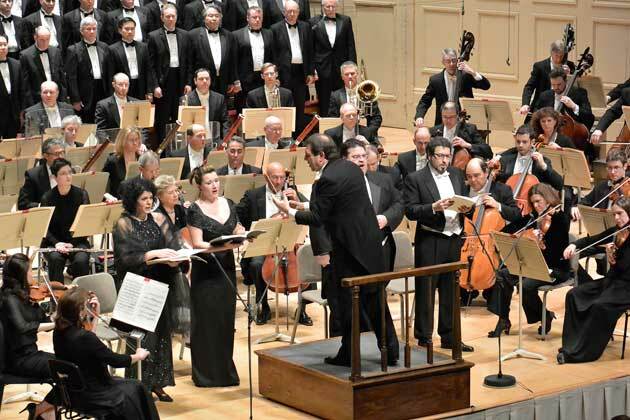 Wisely offered without intermission, the program was conducted by the much-admired Daniele Gatti, who is rumored to be a strong contender in the search for a new BSO Music Director. Rachel Childers, second horn player in the orchestra (and the first female brass player in the history of the Orchestra), led off the evening with an informative, amusing and entirely appropriate, brief talk in which she spoke of how it feels to play in the horn section. Maestro Gatti knew just how to follow, and allowed enough time after his entrance for the audience to settle and appreciate what was to unfold. His sensitive reading of the score brought forth many lucid and musical moments, and great credit goes to the Tanglewood Festival Chorus for just the right hushed sound here, or magnificent triumph there. The utter security of singing from memory makes the chorus’s contribution even more significant. Maestro Gatti also conducted without a score. The team of soloists was well matched, with tenor Stuart Neill substituting for the ailing Fabio Sartori. Most impressive was mezzo-soprano Ekaterina Gubanova, who sang with gorgeous, rich color, and unobtrusive depth. Neill brought just the right mood to the famous “Ingemisco” aria, which the program note reported he has sung more than 200 times, and he was the only soloist to sing from memory in this program. If bass Carlo Colombara lacked the ultimate power to declaim “Confutatis maledictis” (which talks of “confounding the damned”), he nonetheless sang with at least adequate power, depth and beauty for the rest of the evening. Soprano Fiorenza Cedolins delivered the most beautifully sung (and truly soft) high B-flat I have ever heard in the final movement. But she fell in the trap of vowel modification early in the evening, singing a too-obvious “Kyri-ah” instead of Kyri-eh.” Professional singers often modify vowels this way, but it should not be so obvious. She and Gubanova were occasionally covered by the orchestra, at least in the balcony where I was seated, but their duets were otherwise some of the highlights of the evening. At the end of the Lux Aeterna, pitch among the soloists in two of the a cappella portions was more than a slight problem, but somehow we concluded in B-flat major in spite of it all. The famous requiems of Verdi, Mozart, Brahms, Faure and a few others present interesting interpretive challenges: so many musicians and listeners are familiar with them that conductors often feel the need to “leave their mark” in ways which sometimes stretch and even snap the threads of musical line for which these works are justifiably noted. Gatti’s approach was most successful in all the shorter movements, but in the second, long movement his tendency to take extra time with breaks in the music, as well as his tempo in the famous “Dies Irae” music (too slow to achieve the gripping drama of those repeated notes and triplets), made the long second movement seem even longer than should have been the case. Many of the numerous sections of this movement were handsomely dealt with, but the overall architecture and sense of line suffered. The other movements were mostly beautiful, and handled with the appropriate degree of intensity and reflection. Gatti made perfect sense of the famous opening bars, with their legendary, hushed iterations of “Re-qui-em,”, and his use of rubato was appropriate and compelling. (One interesting touch in the second movement was as the chorus actually spoke the words “quantus tremor” (“how great a terror”): I had never heard that effect before, and it worked. The Offertorio, Sanctus and Agnus Dei were given much better tempos, although orchestra, chorus and soloists occasionally threatened to slip off the tracks. Several expressive moments in the Lux Aeterna went by with little recognition, but the final movement (“Libera Me”) was the highlight of the evening, and beautifully conceived. In retrospect, this was a performance to admire in so many ways that I wish I could say I was as deeply moved as one hopes to be with this splendid music. I heard the Friday concert, so perhaps the final program tonight will ascend just the few steps necessary to make it so. On Thursday the singers were never covered by the orchestra where I sat in the 2nd balcony. Nor did I notice “extra breaks” in the 2nd movement. And Neill’s delivery of the “Hostias” was extraordinary, beyond praise, genius…. Noteworthy as well, I think, is the fact that Gatti didn’t feel the need to ramp up the volume to blow us out of our seats. There was power and mass and, yes, volume as required. Quite a number of other conductors, and most younger ones, could learn from his example. RE: “Daniele Gatti, who is rumored to be a strong contender in the search for a new BSO Music Director”. Aren’t we also looking for conductors who can visit annually for 2 or 3 weeks? We have some aging regulars. There’s more than one search under way, I think. At least I hope so. The term acappella is new to me. Do people use it? I missed the last few BSO concerts because of the flu + don’t listen to the broadcasts becaue of poor reception. The term a cappella has been used by every musician: singer, chorus, conductor for about 1000 years! Charles Dutoit returns to conduct 3 concerts on Thursday, Friday afternoon and Saturday. In exchange for his unusually intelligent commentary, we’ll cut Brian a bit of slack for letting a typo slip through, OK? In the Quantus tremor, Mo. Gatti orchestrated the chorus as follows: first line, basses sang with pitch, but very breathy, all other parts “sing only with air”; next line, basses focused their pitch more, tenors added pitch to their air; next line altos ibid., etc. He balanced and colored he whole ensemble (give or take 250 performers) with such care, imagination and intelligence throughout the piece. From inside, the tempos felt very good, precisely because they were fast but not hell-bent for leather. Certainly nothing lagged. One intelligent listener in the audience Thursday said that the quietest sounds had just enough substance, and it never got louder than it needed to (of course it got pretty loud…) and the tempos were never too fast. The Dies Irae, with its many parts, is indeed very long. Gatti consistently pulled us back from our natural tendency to run – hell-bent for leather – through these sections, and wanted the triplet quarters to make a massive effect. I, at least, was glad for his pacing, and spacing of the sections (and I think I would have been were I in the house). There’s a lotta hell out there in the abyss, Brian! Ed Burke: a cappella was typoed w/ ‘cc’, then fixed in response to Jerome’s query, but his comment was not subsequently trimmed. Nor the next. So the presentation is now inexplicable. I suppose I shouldn’t be surprised that the original typo has been fixed, but MY COMMENT HAS BEEN EDITED! Our attendance at the Saturday evening performance was spoiled by the persistent, loud hacking cough of the lout behind me. When I apoke to him after the concert, he responded that I was entitled to my opinion. Can’t the BSO do something about such boorish behavior? Just heard this on the WAMC one-week-delay feed last night. It was the worst Verdi Requiem performance I have ever heard. Maestro Gatti went for timid, sleepy tempi and ritardandi throughout; the singers were poor and the soprano barely hit her high note at the end of her section with chorus alone just before the Libera Me; the TFC sounded like college kids; the BSO played with almost no fire, and the Dies Irae went totally flat. Has Maestro Gatti ever heard of someone named Toscanini and the recordings of his unforgettable live performances?